Slowly disproving stereotypes, the online VC has established itself as a viable tool for tech finance. But while the model has made money for investors, the industry still faces perceptions of selling money for money’s sake, without much care for the nuanced entrepreneur-investor relationship. FundersClub, one of the earliest and most active online funds, is building out its own eight-person engineering team to build hacks for its portfolio and experiment with what the full-service venture capital firm looks like at scale. FundersClub’s effort, Catalyst, differentiates itself by focusing on founding teams rather than just founders. The first three tools set to be released are Fire bot, Standup and Reports. 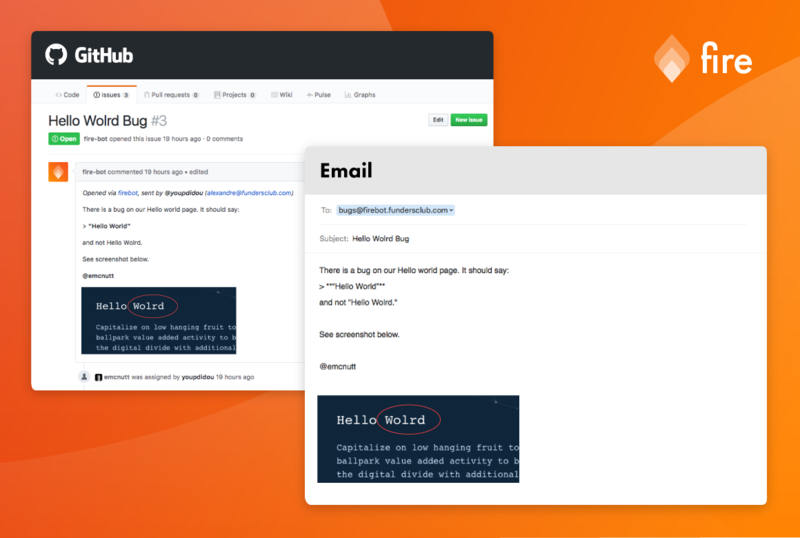 Fire bot, available today, enables non-technical team-members to report bugs on GitHub by simply sending an email. The hope is to save engineers from the hell that is random workflow disruptions from Jimmy, the well-intentioned but ill-informed business development associate. Standup and Reports will be released in the coming weeks. Standup will summarize GitHub activity in advance of common weekly standups, effectively vocalized progress reports. Reports will serve a similar function by sending weekly engineering activity metrics to Slack . FundersClub’s previous engineering project was Network Search, an attempt to leverage its large community to deliver network effects to founders and investors. The full-service VC firm is nothing new. It’s existed in physical form for years, carried forward by firms like Andreessen Horowitz and First Round Capital. These firms invest a lot of capital into their own firms to build proprietary software to help with their internal sourcing and diligence processes and to aid portfolio companies with proprietary LinkedIn style tools. Brett Berson, partner and leader of First Round‘s platform team, told me that his team spends 75-80 percent of its time building tools for portfolio companies. But these tools tend to have more in common with FundersClub Network Search than Catalyst. FirstRound portfolio companies can ask each other questions in private and reference anonymized compensation, benefits and vendor data. Kleiner Perkins Caufield & Byers’ EDGE is another example of where engineers and Sand Hill Road collide. Anjney Midha, founding partner at EDGE, led an effort to build an app called Office Hours that dumps the elitist coveted warm intro in favor of an open messenger that lets anyone chat with a partner at the seed-stage fund. But neither of these efforts benefit the average early-stage startup employee. And, critically, Catalyst is completely open to the public, unlike other proprietary products. While FundersClub’s image undoubtedly benefits from every download and mention, startup employees just want s**t to work. This is all it will take to make an impact, to displace just a single operator’s hack for getting things done, whether it be something small from Product Hunt or a larger combination of Asana, Slack, GitHub, Salesforce, etc. From an ecosystem perspective, it makes sense that the manifestation of the full-service online VC would be software. Partners don’t scale and neither do dinners South of Market, personal introductions or marketing and strategy services. The only question left is whether competitors see Catalyst as a trend worth following or an unnecessary distraction.